I have been playing the harpsichord since ca. 1978, and had five years of intensive study with Paul Simmonds. At home I have a copy completed by Andrew Wooderson in 2004 of the single manual instrument by J.J.Antunes 1758 in the National Instrument Museum, Lisbon. 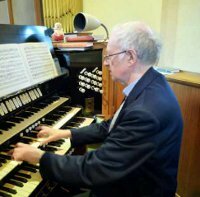 I have been organist at St. George’s church, East Worthing since June 1984. I regularly give concerts in London and the south, frequently basing these around composers whose anniversaries are commemorated in the year of presentation. For further information please see Music page. For many years I have been a regular reviewer of scores, CDs and books for numerous Journals and Magazines. I also write articles on aspects of performance practice and individual composers as well as each year compiling a detailed list of composers whose anniversaries fall in that year together with their works and modern editions where known - for further information see Publications page. For several years I have been assisting David Patrick of Fitzjohn Music by writing notes on performance practice for the series of modern editions of 18th century English organ Voluntaries. I speak French, German, Portuguese and Spanish and undertake translations. For further information see Translations page.